Failing to plan for your participation in a trade show is planning to fail. Without a solid plan for pre-show marketing, attracting the right attendees to your booth during the show and post-show follow-up, your substantial investment will go to waste. What is the theme and message of your booth? Pick one key message and focus on it. Make your solution instantly clear – you only have a few seconds to capture someone’s attention as they walk past your booth. What real pain does your company solve for your target audience? Focus on communicating that. Be brief, clear and bold. How will you attract attendees to visit your booth? Create a small theater-like seating area where you can do educational presentations. An amplified sound system will carry the sound of the presenter beyond your booth, making other attendees curious about what’s going on. Remember to keep the focus on attendee education, not pitching your products and services. Keep the presentations short – no more than 10-15 minutes. Respect attendees’ limited time on the show floor. Create a hands-on demonstration area where attendees can interact with your product. Done right, it can be a real attention-getter! Have a plan for pre-show promotion to your target audience. Don’t just assume they’ll show up at your booth during show hours. Invite them! Your ultimate goal is to get on the short list of booths that they plan to visit during their limited time at the show. Make it worth their while – offer an incentive. Your pre-show marketing strategy should be multi-faceted, and may include email, social media, direct mail and personalized invitations. Set a goal for the number of attendee visits and conversations you want to achieve during the show, how many of them will result in sales leads and how many of them will convert to sales. It’s the classic sales funnel – only this time, it’s focused on trade show prospects. It is ESSENTIAL to have a follow-up plan for the leads you collected during the trade show. You must have this infrastructure in place prior to the exhibition, so it can run on auto-pilot when you return to the office. Your goal is to keep the conversation going with the prospects you met during the show. The best way to do this is with an email nurturing stream – a succession of messages that are designed to be delivered on a timed basis. For best results, give careful thought to a succession of topics that logically lead the prospect along a path to sale. 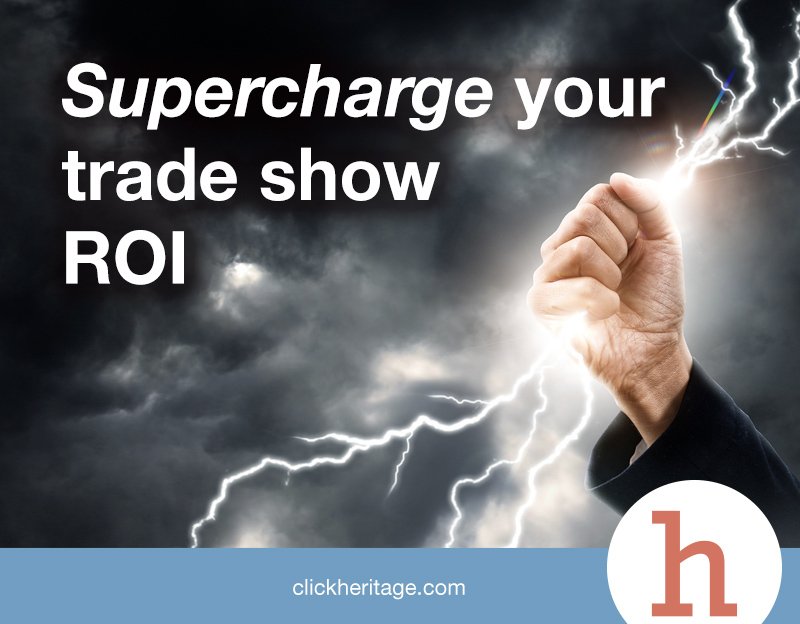 For more strategies to increase the ROI of your trade show participation, please contact Heritage at 262-790-5000.